Considering the dynamic nature of ICT and its contribution to business growth and prospects which later translate to national development and prosperity, the aim of this research was threefold; study and examine ICT-business alignment cases in Zimbabwe, establish the current state of ICT-business alignment in the Zimbabwean business sector, and determine factors that have a propelling or frictional effect on alignment transition. The research results indicated that ICT and business executives in Zimbabwe appreciate that ICT contributes positively to business growth and sustainability of their organizations. However, the majority of these executives do not understand and apply the concept of IT-business alignment in their organizations. Another notable result was that to achieve alignment in a turbulent environment there are many factors that have a propelling or dragging effect on alignment. The factors have differing magnitude of effect on alignment as such a critical analysis of each factor is required. 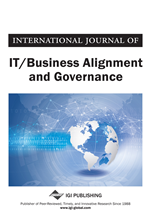 ICT as a resource should be deployed by organisations to create alignment with the business, (Pijpers, de Leenheer, Gordijn, & Akkermans, 2011). According to Zimbabwean National Information and Communication Technology Policy Framework (2005), ICT embraces the use of computers, telecommunication office systems and technologies for the collection, processing, storing, packaging and dissemination of information. Henderson and Venkatram (1993) defined alignment as the degree of fit and integration among business strategy, IT strategy, business infrastructure and IT infrastructure. Mckeen & Smith (2003) viewed alignment as the state of harmony that exists between an organisation’s goals and activities and the supporting information systems. Luftman and Brier (1999) went on to define good alignment as a situation where the organisation is applying the appropriate IT in given situations in a timely way, and that these actions stay congruent with the business strategy, goals and needs. The government of Zimbabwe through its strategic plan 2010-2014 viewed alignment as the central point in order to produce effective results, as such the ministry pledged to ensure proper alignment in all business processes. In this context business refers to an operational entity or organisation with a clear statement of goals and mission to accomplish, be it profit making or non profit making, governmental or non – governmental, small or large.